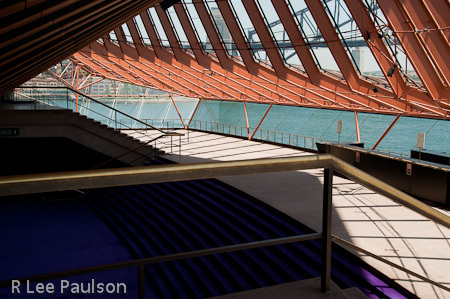 Experiencing the Sydney Opera house is something I believe should be on everyone's bucket list. This building moved me in a way I had not experienced since standing in the Temple of Luxor in Egypt. We came back down to the waterfront after checking into our hotel and dropping off our bags. Our 3 day metro pass we just received had a very cool feature: It also allowed us unlimited rides on most of Sydney's ferries. I woke up early the morning we sailed into Sydney harbor. 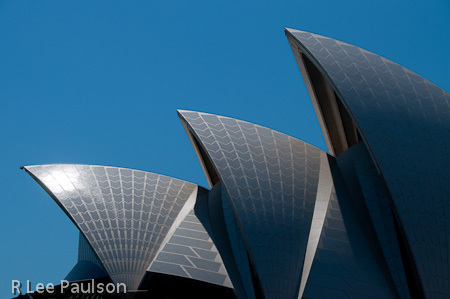 I happened to look out the window and was thrilled to see us sail around the Sydney Opera house then dock opposite it in the harbor. 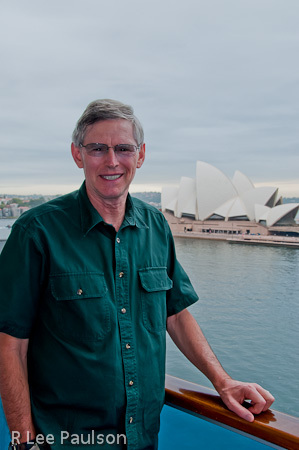 Melony took this shot of me on our balcony with the Opera House in the background that morning before we left our cabin for the last time. 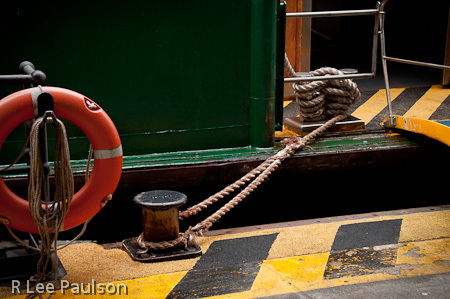 We had expected it would take a good chunk of the day for us to disembark from the ship, get our luggage and clear customs. How wrong we were. 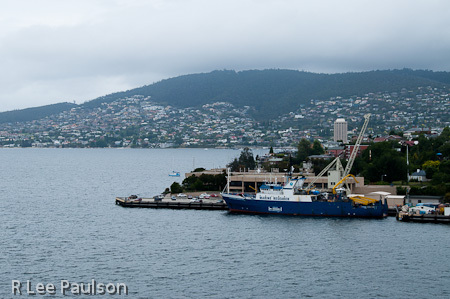 We docked in Melbourne under low clouds and light drizzle. 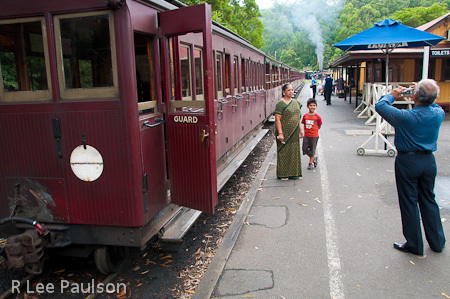 Immediately after breakfast, we disembarked from the ship, walked past a long line of tour buses before arriving at the one which would take us to the Puffing Billy train. 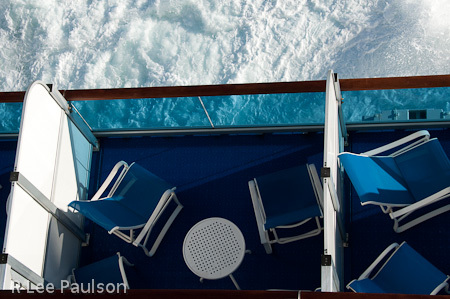 I loved watching the ocean while we were at sea. These are balconies for the high priced suites, a couple of decks below us. But, I digress. In Melbourne, I had wanted to ride the narrow gauge steam train. So, early the next morning, we found ourselves at the Puffing Billing train station near Melbourne. They were having lots of rain and flooding in Australia when we were there. Fortunately the flooding was north of us, but we woke up most mornings to overcast skies. 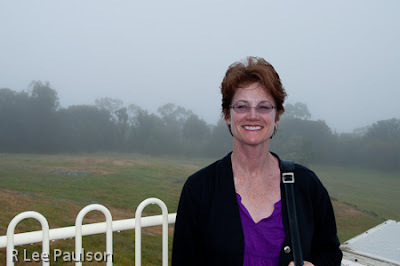 That did not deter the bus driver on this foggy day from driving us up a mountain top to enjoy a "fabulous" view of the area around Hobart. Since he made the effort, I felt it my duty to record the "marvelous" view before we got back on the bus. 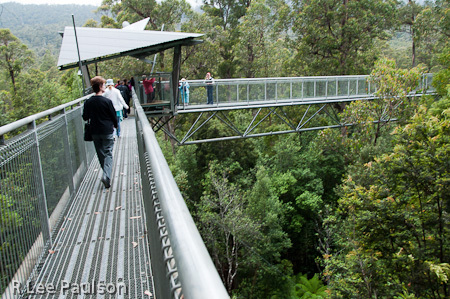 The real reason for our excursion was to experience this treetop view of a forest called the Tahune Forest Airwalk. 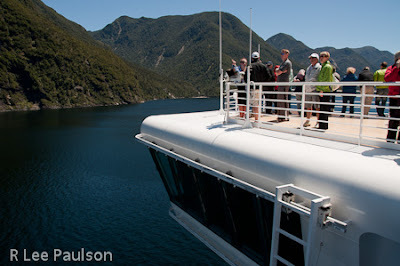 After leaving Dunedin we sailed around the southern end of New Zealand to some spectacular fiords in Fiordland National Park, there. This was one of most spectacular aspects of the entire voyage for us.